Weinberg junior Joji Syed and SESP junior Christina Cilento announced their Associated Student Government presidential bids Tuesday night. Syed, running with Weinberg sophomore Archit Baskaran, is currently the vice president for community relations and Cilento, running with McCormick junior Macs Vinson, is currently the vice president for sustainability. 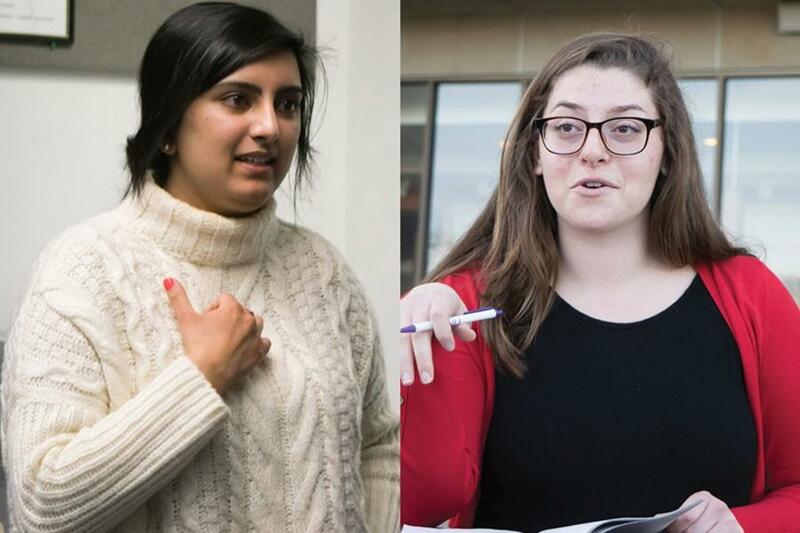 Weinberg junior Joji Syed and SESP junior Christina Cilento announced their bids to run for Associated Student Government president Tuesday night, beginning their nine-day campaigns. Weinberg sophomore Archit Baskaran will run for executive vice president alongside Syed, and McCormick junior Macs Vinson will run with Cilento. Syed and Baskaran said they aim to better incorporate voices from different student groups and leverage decision-making powers to aid them. Cilento and Vinson said they want to make ASG more responsive to marginalized students and make the University respond to those concerns. Both tickets emphasized a focus on amplifying underrepresented voices in student government. Syed currently serves as vice president for community relations, and Cilento is vice president for sustainability. Baskaran sits on the community relations committee and Vinson serves as vice president for student activities. “People (in ASG) tend to go with what has been successful in the past if something has been tried, and if it hasn’t been successful, students try to avoid that project,” Syed said. “For me, I’m very big on ‘give it a shot,’” she said of her involvement with the community relations committee, which she joined her freshman year. Syed said she was involved in bringing Divvy bikes to campus and collaborated with local elementary and middle schools to reach out to the Evanston community and make new resources available to students. Baskaran met Syed when he joined the community relations committee his freshman year. Their campaign will focus on social justice and accessibility of administration as well as emphasizing student groups’ voices to make ASG more relevant in their lives, he said. Cilento and Vinson said they decided to run when they realized they were unhappy with the representation of student voices. Vinson said, for some, ASG has had a bad reputation on campus as underserving marginalized communities and being a “hostile” place for underrepresented groups. He said ASG must work closer with the administration and student groups to reflect their opinions and be more responsive. Voting begins Thursday April 7 at 5 p.m. and ends the next day at 5 p.m.